Vaughan I.M. Henshaw, 84, died here December 20, 1980 Born in Perth, N.B., he was a son of the late Commodore Herbert A. and Lena (Lovely) Henshaw. He attended Acadia University. He served overseas in the First World War with the 26th New Brunswick Battalion, and was wounded in 1915. He is survived by his wife M. (Margaret) Jean (MacQuarrie); a daughter, Mrs. Jean Dole, California; two sons, Donald, Moorefield, Ontario, and Harold V., Parrsboro; 11 grandchildren. He was predeceased by a brother Eldon. Burial will be in Parrsboro May 19, 1981. Posting Jul 6 2003 by Barbara Dutton Gaylord () to MATHESON-L citing: family notes of Flora MacQuarrie Emery. Obituary of Harold Vaughan Henshaw. Contribution from Paula Jean Henshaw Lessard citing: Herbert Henshaw family bible. 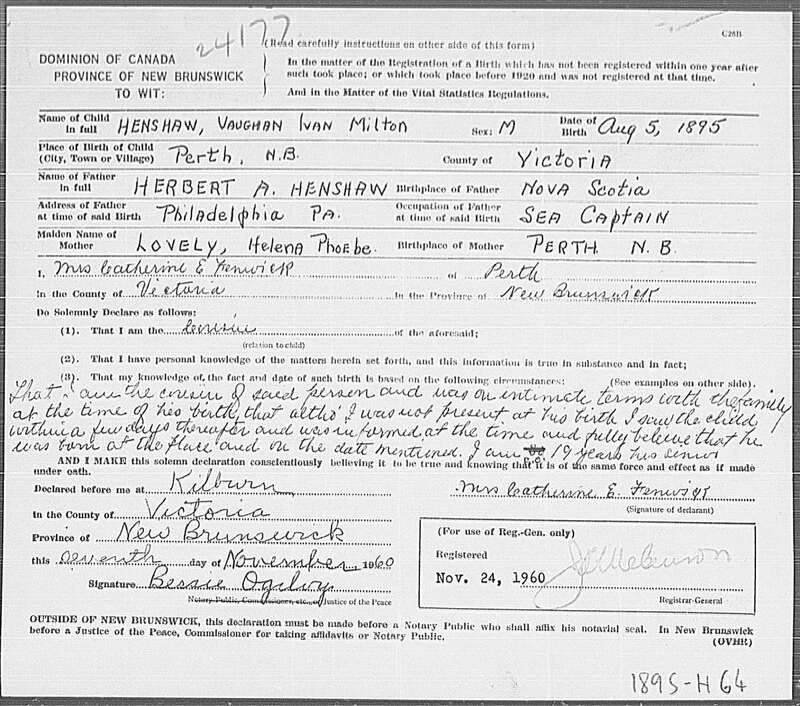 citing Perth, Victoria, New Brunswick, certificate 24177, Provincial Archives, Fredericton; FHL microfilm 1943986.
citing Perth, New Brunswick, Canada, 05 Aug 1895, reference ; FHL microfilm 1943986.
citing registration 011622, Oakville, Halton, Ontario, Canada, Archives of Ontario, Toronto; FHL microfilm 002378811. 1910 census, 6th Ward, Newton, Middlesex County, Massachusetts; roll T624-603, ED 976, page 10B, line #90, dwelling #250, family #263.
marriage register for Vaughan Ivan Milton Henshaw & Margaret Jean MacQuarrie. Ancestry Family Tree data "McCall-Payne Family Tree" posted by "gailmccall". Ancestry Family Tree data "Family Tree of Connor E. DeMerchant, updated on October 3, 2013" posted by "kdemerch". "The Chronicle Herald", December 31, 1980.